A rather basic virtual analogue synth with a great sound and just enough interesting features to make us want more for our money. ...Limitations seem arbitary. Full price is too high for what you get. Doesn't stand out from the competition. 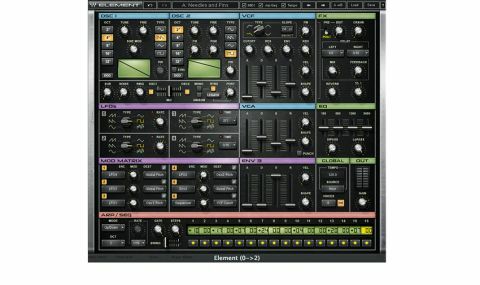 "Element is, at its most fundamental level, a two-oscillator subtractive synth"
Element is, at its most fundamental level, a two-oscillator subtractive synth. However, there's also a sub-oscillator available and an independent noise generator, so you won't have to give up either oscillator to add a little whoosh and weight to your patches. The oscillators offer a choice of octaves and the usual sine, triangle, sawtooth and square/ pulse waves. Pulse width modulation is available, with Coarse and Fine tuning knobs to give you control over the pitch. You can switch between VCO and DCO modes, the latter offering more precision and re-triggering the wave cycle at note-on. Osc 1 gets a Sine Mod knob, which introduces modulation from a sine wave - a nice touch that can really change up the wave shape without sacrificing the second oscillator on the altar of modulation. Oscillator 2 gets a standard FM variation, with Osc 1 as the modulator, and its phase can also be modulated by Osc 1. Oh, and you can synchronise the oscillators for those classic nasal sync lead lines. The sub-oscillator and noise generator reside just below the main oscillators, along with a slider to balance the mix between Oscs 1 and 2, a knob for introducing some ring modulation and a smattering of controls for adjusting how the oscillators will be played. There's a Portamento knob, re-triggering assignment (Always or Legato being the available options), and Mono and Unison switches. There's not a lot of variation on offer here, however: for example, you can't adjust the unison voice spread or panning (it's just on or off), and there's only one noise colour. Likewise, the sub-oscillator can be mixed in, but you don't get to select its octave or wave shape - you get a triangle waveform playing an octave below Oscillator 1. This is enough to add a little low-frequency energy to your sounds, but is a strange choice, given that, by and large, the traditional analogue sub-oscillator circuit produces a meatier square wave. Element's single filter provides low-pass, high-pass, notch and band-pass modes, with a choice of Moog-style 24dB or Oberheim-esque 12dB/octave slopes. The FM knob enables modulation of the filter cutoff with Oscillator 1. This is a great feature, useful for mimicking the cross-modulation tricks from certain famous instruments of the 80s. Cutoff can also be modulated by note pitch and velocity, with dedicated knobs for dialling in the desired amount. Finally, on the filter front, there is, of course, a dedicated filter envelope. "The individual stages of both the Amp and auxiliary third envelopes can be selected as a modulation destination - something we wish every synth had!" Element features the usual array of modulation sources, including a trio of envelopes and four LFOs. The envelopes are simple four-stagers, with Attack, Decay, Sustain and Release sliders. You'd think that's nothing to write home about, but each slider has a Shape knob attached, which determines the angular response of the envelope's contour: turn it up for sharper shapes and down for smoother ones. The VCA (amplitude) envelope also benefits from a Punch button, giving it more bite. Most importantly, the individual stages of both the Amp and auxiliary third envelopes can be selected as a modulation destination. Now that's something we wish every synth had! Each of the four LFOs can output saw, ramp, triangle, sine, square and random waves. Two of them are free-running, while the other two can be clocked to host tempo. We're not sure why they're differentiated like this - a simple switch for each would have been preferable. Further tweaking is provided by the usual assortment of effects. Reverb, chorus, delay, distortion, bitcrusher and fixed-band graphic EQ are all on tap. All but the sync-able delay and EQ are dead simple one-knob jobs - all sound good, the EQ being particularly noteworthy. Waves has done a good job in providing a simple, one-screen interface with plenty of thoughtful touches. You can select multiple parameters at once for simultaneous tweaking, and MIDI learn is onboard, although we found it a bit sluggish when used with our M-Audio O2 controller keyboard. There is a standalone mode and VST, AU, RTAS formats are accounted for. Most importantly, it sounds absolutely superb, with a phat, rounded analogue tone. The real question, however, isn't whether it's any good (it absolutely is), but whether you really need it. The introductory price of $99 is reasonable, but the regular $199 tag is pretty steep for what it offers in comparison to the competition, much of which sounds similarly excellent but is more full-featured. Many will, no doubt, buy it for its pedigree, and those who do will find it an excellent workaday synth that's easy to use and sounds utterly authentic. If you're looking for something new or in any significant way different to the many virtual analogues you probably already own, you might want to pass this one by and seek out something more forward-thinking instead.